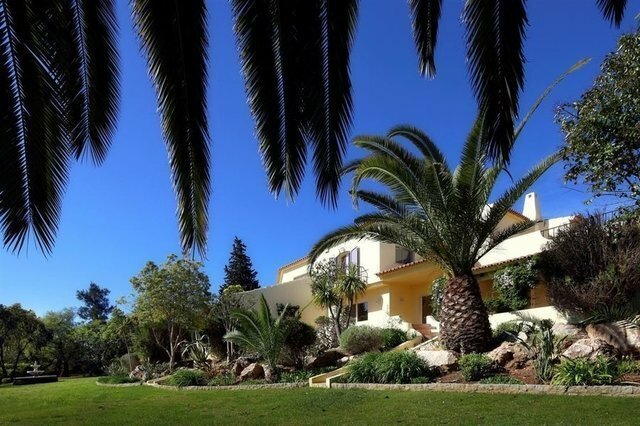 This stunning 5 bedroom villa is located in the quiet area of Serra e Mar, a short drive from the well known village of Alvor. It offers a lot of privacy as the 550 square metre villa is situated in the middle of the huge 6200 square metre plot of land. The manicured lawned gardens are beautifully decorated with a variety of flowers, bushes, fruit and palm trees. It consists of five very large double bedrooms (all with private balconies), eight baths/showers, two large lounges, a breakfast room, games room, a spacious kitchen and pantry. The property is fully air-conditioned and is equipped with a sophisticated computer run security and sound system throughout. The property has its own bore hole and gas tank. It does not come short in terms of ammenities, boasting a kidney shaped pool, a great Australian gas barbeque area, an indoor sauna, games room and an annex where a gym would fit perfectly. There is covered parking for five vehicles as well as a large double door garage where three cars can fit. This magnificent property would make an ideal large family home and has great potential for expansion within the spacious grounds. Another suitable option would be a boutique bed and breakfast or company retreat house.